This post comes with a warning. 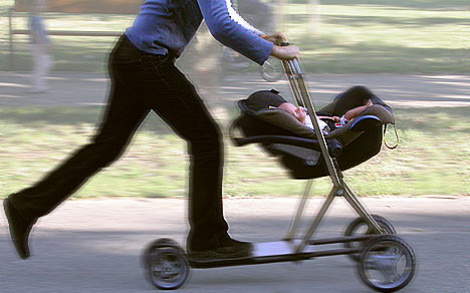 Babyology is in no way endorsing ditching the Bugaboo and test driving a scooter next time you need to dash to the shops. Depending on which way you look at it, the Roller Buggy by Valentin Vodev transforms an ordinary pram into a scooter or a scooter into a pram. This clever convertible lets you take to the streets at a cracking pace but switch back to traditional pram mode once you hit a crowd. Maybe it’s my in-built-parent-alert-system but whenever someone tells me repeatedly that something is perfectly safe for my child, I begin to get the feeling that perhaps it is not. Needless to say, the Roller Buggy does come with some safety stipulations – your passenger must be at least eighteen months old, always use the safety harness and don’t travel more than fifteen kilometres an hour. Other than that, the Roller Buggy apparently copes with any terrain and promises to speed up what used to be a stroll. If your toddler has a need for speed, they will have to wait. The Roller Buggy is only a concept at this stage. You have to check out the other sixty-six bizarre baby gifts over at Trendhunter, some of my favourites being the Snuggies for baby, $17,000 diamond dummy and babies dressed as food! Looking for a groovy set of wheels for your baby? Try out our Chooser which helps you compare prams on the market.